Most people will only ever know the inside of a courtroom from the fiction of TV. But for Emily Rezkalla, Wilfrid Laurier University student and president of Laurier’s student mooting club, preparing for a career in the courtroom couldn’t be more real. Moot means “open to discussion.” Members of the Laurier Moot Court (LMC) club practice verbal advocacy skills and demonstrate their understanding of the law in a simulated appellate court (court of appeals). Opposing pairs of student mooters persuasively advocate how the law applies to their client – either the appellant or the respondent – before a judge. At the end of the presentations, the judge delivers his or her ruling, which, in competition, advances one mooting team to the next round while eliminating the other. Like a real courtroom proceeding, moots require extensive preparation. It’s a learning experience that LMC faculty liaisons and Laurier alumni Phaedra Klodner (BA ’92) and Jeff Boich (BA ‘88) are happy to facilitate. Klodner and Boich teach in the Department of Political Science and are registered with the Law Society of Upper Canada. 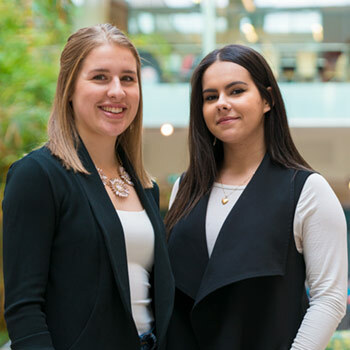 Klodner has a private practice in Kitchener and Boich is in-house counsel for a local government organization; their professional experiences from the private and public sectors contribute to the preparation of Laurier student mooters. Kitchener lawyer Diane Sousa and Madame Justice Catrina D. Braid of the Ontario Supreme Court of Justice also hear the presentations, providing student mooters with opinions from both sides of the bench. LMC members practise their presentations before their panel of experts, who then “grill the students” as a judge in the competition (or a court of law) would, says Klodner. The month leading up to a moot court competition is intense. Once competition organizers release the cases to be mooted, Klodner, Boich and student mooters get to work. They meet several times in the days immediately following a case announcement, working collaboratively to understand how the law applies to the appellant or respondent’s cases. The student teams then meet separately to draft the oral presentations that they will deliver at the competition. Because they won’t know which side they will advocate for in competition until minutes before court is called to session, they have to prepare arguments to support both the appellant and the respondent – an added layer of pressure and complexity. In the days leading up to the competition, student mooters reconvene to practice the delivery of their presentations, taking constructive feedback from their campus and community coaches as needed. Rigorous preparation has paid off for the newly formed student club. One LMC duo placed 11th out of 115 at the prestigious Osgoode Cup National Undergraduate Mooting Competition at York University in Toronto in March 2017, which exceeded their hopes of finishing in the top third at their competitive debut. LMC’s Senior Vice-President Emma Borho placed 12th in Canada for her presentations at the Capital Cup, the annual national undergraduate competition held at Carleton University in November 2017. The club’s successful entry to the competitive mooting circuit is testament to the calibre of students it attracts, Rezkalla says: strong students enticed by the academic challenges that mooting offers. “There were 115 students who applied to be part of Laurier Moot Court for the 2017/18 academic year. The club executive interviewed approximately 40 mooting candidates and selected the top 20 students for the team,” says Rezkalla, who attributes the increased interest in the Waterloo campus club to Laurier’s combined Honours Bachelor of Arts (BA) degree and a Bachelor of Laws (LLB) program. The double-degree program, announced in fall 2015, allows students to obtain a BA from Laurier and an LLB from the University of Sussex in Brighton, England. With another strong team assembled, LMC plans to compete in the University of Toronto Cup moot in February 2018 before returning to the Osgoode Cup in March. While student teams from Carleton University McGill University offer stiff competition, Rezkalla is confident in her team’s abilities. With skilled teammates, dedicated coaches and a rising momentum, the possibility of a top 10 finish in LMC's near future is something Rezkalla isn’t ruling out.